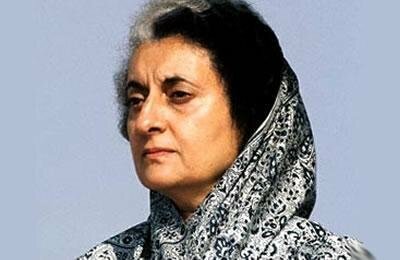 Indira Priyadarshini Gandhi (Hindustani: [ˈɪnːdɪrə ˈɡaːnd̪ʱi] )November, 16 1917 – October, 31 1984) was the third Prime Minister of India and a central figure of the Indian National Congress party. Indira Priyadarshini Gandhi (Hindustani: [ˈɪnːdɪrə ˈɡaːnd̪ʱi] )November, 16 1917 – October, 31 1984) was the third Prime Minister of India and a central figure of the Indian National Congress party. Gandhi – who served from 1966 to 1977, and then again from 1980 until her assassination in 1984 – is the second-longest-serving Prime Minister of India and the only woman to hold the office. Indira Gandhi was the only child of Indian Prime Minister Jawaharlal Nehru. She served as the Chief of Staff for her father’s highly centralized administration between 1947 and 1964; while there she came to wield considerable unofficial influence in government. Elected Congress President in 1959, she was offered the premiership in succession to her father. Gandhi refused, instead chosing to become a cabinet minister within the government. She finally consented to become Prime Minister in succession of Lal Bahadur Shastri in 1966. As Prime Minister, Gandhi became known for her political ruthlessness and unprecedented centralization of power. Under her leadership, India emerged as a significant power and became the regional hegemon of South Asia with considerable political, economic, and military developments. Gandhi also presided over a state of emergency from 1975 to 1977. During this time she ruled by decree, making lasting changes to the constitution of India. She was assassinated in the aftermath of Operation Blue Star on October 31, 1984. In 2001, Gandhi was voted the greatest Indian Prime Minister in a poll organized by India Today. She was also named “Woman of the Millennium” in a poll organized by the BBC in 1999. Indira Nehru was born on 19 November 1917 in Allahabad. Her father, Jawaharlal Nehru, led India’s political struggle for independence from British rule and became the first Prime Minister of the Union (and later Republic) of India. She was an only child (a younger brother was born, but died young), and grew up with her mother, Kamala Nehru, at the Anand Bhavan – a large family estate in Allahabad. Indira had a lonely and unhappy childhood. Her father was often away, directing political activities or being incarcerated in prison for those activities, while her mother was frequently bed-ridden with illness and later suffered an early death from tuberculosis. Indira had limited contact with her father, communicating mostly through letters. Indira was mostly taught at home by tutors and intermittently attended school until matriculation in 1934. She went on to study at the Viswa Bharati University in Shantiniketan. A year later, however, she had to leave university to attend to her ailing mother in Europe. While there, it was decided that Indira would continue her education at the University of Oxford in Britain. After her mother passed away, she briefly attended the Badminton School before enrolling at Somerville College in 1937 to study history. Indira had to take the entrance examination twice; having failed at her first attempt due to a poor performance in Latin. At Oxford, she did well in history, political science and economics, but her grades in Latin—a compulsory subject—remained poor. Mahatma Gandhi fasting in 1924, with the young Indira, who is dressed in a khadi garment, following Gandhi’s advocacy that khadi be worn by all Indians instead of British-made textiles. During her time in Europe, Indira was plagued with ill-health and was constantly tended to by doctors. She made repeated trips to Switzerland to recover, which disrupted her studies. She was being treated by the famed Swiss doctor Auguste Rollier in 1940, when the Nazi armies rapidly conquered Europe. Indira tried to return to England through Portugal but was left stranded for nearly two months. She managed to enter England in early 1941, and from there returned to India without completing her studies at Oxford. The university later conferred on her an honorary degree. In 2010, Oxford further honored her by selecting her as one of the ten Oxasians – illustrious Asian graduates from the University of Oxford. During her stay in the UK, young Indira frequently encountered her future husband, Feroze Gandhi, whom she knew from Allahabad and who was studying at the London School of Economics. The marriage took place in Allahabad according to Adi Dharm rituals, though Feroze belonged to a Parsi family of Gujarat. In the 1950s, Indira, now Mrs. Indira Gandhi after her marriage, served her father unofficially as a personal assistant during his tenure as the first Prime Minister of India. After her father’s death in 1964 she was appointed as a member of the Rajya Sabha (upper house) and became a member of Lal Bahadur Shastri’s cabinet, serving as Minister of Information and Broadcasting. When Indira became Prime Minister in 1966, the Congress was split in two factions: the socialists led by Gandhi, and the conservatives led by Morarji Desai. Rammanohar Lohia called her Gungi Gudiya, which means ‘Mute Doll’. The internal problems showed in the 1967 election where the socialist faction, led by Ghandi, lost nearly 60 seats – winning 297 seats in the 545-seat Lok Sabha. She had to accommodate Desai as Deputy Prime Minister of India and Minister of Finance. In 1969, after many disagreements with Desai, the Indian National Congress split. She ruled with support from Socialist and Communist Parties for the next two years. In the same year, in July 1969 she nationalized banks. Victory over Pakistan in 1971 consolidated Indian power in Kashmir. Gandhi indicated that she would make no major concessions on Kashmir. The most prominent of the Kashmiri separatists, Sheikh Abdullah, had to recognize India’s control over Kashmir in light of the new order in South Asia. The situation was normalized in the years following the war after Abdullah agreed to an accord with Gandhi, giving up the demand for a plebiscite in return for a special autonomous status for Kashmir. In 1975, Gandhi declared the state of Jammu and Kashmir as a constituent unit of India. The Kashmir conflict remained largely peaceful if frozen under Gandhi’s premiership. Gandhi questioned the continued existence of a privy purse for Indian monarchs. She argued the case for abolition based on equal rights for all citizens and the need to reduce the government’s revenue deficit. The nobility responded by rallying around the Jana Sangh and other right-wing parties that stood in opposition to Gandhi’s attempts to abolish royal privileges. The motion to abolish privy purses, and the official recognition of the titles, was originally brought before the Parliament in 1970. It was passed in the Lok Sabha but felt short of the two-thirds majority in the Rajya Sabha by a single vote. Gandhi responded by having a Presidential proclamation issued; de-recognizing the princes; with this withdrawal of recognition, their claims to privy purses were also legally lost. However, the proclamation was struck down by the Supreme Court of India. In 1971, Gandhi again motioned to abolish the privy-purse. This time, it was successfully passed as the 26th Amendment to the Constitution of India.Many royals tried to protest the abolition of the privy-purse, primarily through campaigns to contest seats in elections. They, however, received a final setback when many of them were defeated by huge margins. Gandhi claimed that only “clear vision, iron will and the strictest discipline” can remove poverty. She justified the imposition of the state of emergency in 1975 in the name of the socialist mission of the Congress.Armed with the power to rule by decree and without constitutional constraints, Gandhi embarked on a massive redistribution program. The provisions included rapid enforcement of land ceilings, housing for landless laborers, the abolition of bonded labor and a moratorium on the debts of the poor. Regardless of the controversy over the nature of the reforms, the long term effects of the social changes gave rise to prominence of middle-ranking farmers from intermediate and lower castes in North India. The rise of these newly empowered social classes challenged the political establishment of the Hindi Belt in the years to come. Under the Indian Constitution of 1950, Hindi was to have become the official national language by 1965. This was not acceptable to many non-Hindi speaking states who wanted the continued use of English in government. In 1967, Gandhi made a constitutional amendment that guaranteed the de facto use of both Hindi and English as official languages. This established the official government policy of bilingualism in India and satisfied the non-Hindi speaking Indian states. Gandhi thus put herself forward as a leader with a pan-Indian vision. Nevertheless, critics alleged that her stance was actually meant to weaken the position of rival Congress leaders from the northern states such as Uttar Pradesh, where there had been strong, sometimes violent, pro-Hindi agitations. Gandhi came out of the language conflicts with the strong support of the south Indian populace. Gandhi considered the north-eastern regions important, because of its strategic situation. In 1966, the Mizo uprising took place against the government of India and overran almost the whole of the Mizoram region. Gandhi ordered the Indian army to launch massive retaliatory strikes in response. The rebellion was suppressed, with the Indian Air Force even carrying out airstrikes in Aizawl. This remains the only instance of India carrying out an airstrike in its own civilian territory. The defeat of Pakistan in 1971 and the secession of East Pakistan as pro-India Bangladesh led to the collapse of the Mizo separatist movement. In 1972, after the less extremist Mizo leaders came to the negotiating table, Gandhi upgraded Mizoram to the status of a union territory. A small-scale insurgency by some militants continued into the late 1970s but was successfully dealt with by the government. The Mizo conflict was definitively resolved during the administration of Indira’s son Rajiv Gandhi. Today, Mizoram is considered as one of the most peaceful states in the northeast. Gandhi further carried out the vision of Jawarharalal Nehru, former Premier of India, to develop the program. Gandhi authorized the development of nuclear weapons in 1967 in response to the Test No. 6 by the People’s Republic of China. Gandhi saw this test as Chinese nuclear intimidation. Therefore, Gandhi – promoting the views of Nehru – established India’s stability and security interests as independent from those of the nuclear superpowers. The program became fully mature in 1974, when Dr. Raja Ramanna reported to Gandhi that India had the ability to test its first nuclear weapon. Gandhi gave verbal authorization of this test and preparations were made in a long-constructed army base named the Indian Army Pokhran Test Range. In 1974, India successfully conducted an underground nuclear test, unofficially code-named “Smiling Buddha”, near the desert village of Pokhran in Rajasthan. While most of the world was quiet on this test, a vehement protest came forward from Pakistan. Great ire was raised in Pakistan; Pakistan’s Prime Minister Zulfi Ali Bhutto described this test as “Indian hegemony” to intimidate Pakistan. Gandhi directed a letter to Bhutto and, later to the world, describing the test for peaceful purposes and India’s commitment to develop its program for industrial and scientific use. The government faced major problems after her tremendous mandate of 1971. The internal structure of the Congress Party had withered following its numerous splits, leaving it entirely dependent on her leadership for its election fortunes. Garibi Hatao (Eradicate Poverty) was the theme for Gandhi’s 1971 bid. The slogan – and the proposed anti-poverty programs that came with it – was designed to give Gandhi an independent national support, based on rural and urban poor. This would allow her to bypass the dominant rural castes both in and of state and local government; likewise the urban commercial class. And, for their part, the previously voiceless poor would at last gain both political worth and political weight. On June, 12 1975 the High Court of Allahabad declared Indira Gandhi’s election to the Lok Sabha void on grounds of electoral malpractice. An election petition filed by Raj Narain (who later on defeated her in the 1977 parliamentary election from Rae Bareily) alleged several major as well as minor instances of using government resources for campaigning. The court thus ordered her to be removed from her seat in Parliament and banned from running in elections for six years. In India, the Prime Minister must be a member of either the Lok Sabha (Lower house in the Parliament of India) or the Rajya Sabha (the Higher house of the Parliament). Thus, this decision effectively removed her from office. Mrs. Gandhi had asked one of her colleagues in government, Mr Ashoke Kumar Sen to defend her in court. Gandhi rejected calls to resign and announced plans to appeal to the Supreme Court. The verdict was delivered by Justice Jagmohanlal Sinha at Allahabad High Court and came almost four years after the case was brought by Raj Narain, the premier’s defeated opponent in the 1971 parliamentary election. Gandhi, who gave evidence in her defense during the trial, was found guilty of dishonest election practices, excessive election expenditure, and of using government machinery and officials for party purposes.The judge rejected more serious charges of bribery against her. Gandhi insisted the conviction did not undermine her position, despite having been unseated from the lower house of parliament, Lok Sabha, by order of the High Court. She said: “There is a lot of talk about our government not being clean, but from our experience the situation was much worse when [opposition] parties were forming governments”. She dismissed criticism of the way her Congress Party raised election campaign money, stating that all parties used similar methods of fundraising. The prime minister retained the support of her party, which issued a statement backing her. After news of the verdict spread, hundreds of supporters demonstrated outside her house, pledging their loyalty. Indian High Commissioner BK Nehru said Gandhi’s conviction would not harm her political career. “Mrs. Gandhi still has overwhelming support in the country today,” he said. “I believe the prime minister of India will continue in office until the electorate of India decides otherwise”. Gandhi moved to restore order by having arrest warrants issued for most of the opposition participating in the unrest. Her Cabinet and government then recommended that President Fakhruddin Ali Ahmed declare a state of emergency because of the disorder and lawlessness following the Allahabad High Court decision. Accordingly, Ahmed declared a State of Emergency caused by internal disorder, based on the provisions of Article 352 of the Constitution, on 26 June 1975. Within a few months, President’s Rule was imposed on the two opposition party ruled states of Gujarat and Tamil Nadu, thereby bringing the entire country under direct Central rule or by governments led by the ruling Congress party. Police were granted powers to impose curfews and indefinitely detain citizens and all publications were subjected to substantial censorship by the Ministry of Information and Broadcasting. Finally, impending legislative assembly elections were indefinitely postponed, with all opposition-controlled state governments being removed by virtue of the constitutional provision allowing for a dismissal of a state government on recommendation of the state’s governor. In 1977, after extending the state of emergency twice, Indira Gandhi called for elections to give the electorate a chance to vindicate her rule. Gandhi may have grossly misjudged her popularityby reading what the heavily censored press wrote about her. In any case, she was opposed by the Janata Party. Janata, led by her long-time rival, Desai and with Jai Prakash Narayan as its spiritual guide, claimed the elections were the last chance for India to choose between “democracy and dictatorship.” Gandhi’s Congress party was crushed soundly in the elections which followed. Indira and Sanjay Gandhi both lost their seats, and Congress was cut down to 153 seats (compared with 350 in the previous Lok Sabha), 92 of which were in the south. The Congress Party split during the election campaign of 1977: veteran Gandhi supporters like Jagjivan Ram and her most loyal Hemwati Nandan Bahuguna and Nandini Satpathy, the three were compelled to part ways and form a new political entity CFD (Congress for Democracy) primarily due to intra-party politicking and also due to circumstances created by Sanjay Gandhi. The prevailing rumor was that Sanjay had intentions of dislodging Gandhi and the trio stood between that. A coalition of opposition, under the leadership of Morarji Desai, came into power after the State of Emergency was lifted. The coalition parties later merged to form the Janata Party under the guidance of Gandhian leader, Jayaprakash Narayan. The other leaders of the Janata Party Charan Singh, Raj Narain, George Fernandes and Atal Bihari Vajpayee. The Janata government’s Home Minister, Choudhary Charan Singh, ordered the arrest of Indira and Sanjay Gandhi on several charges, none of which would be easy to prove in an Indian court. The arrest meant that Indira Gandhi was automatically expelled from Parliament. These allegations included that she “had planned or thought of killing all opposition leaders in jail during the Emergency”. However, this strategy backfired disastrously. Her arrest and long-running trial, however, gained her great sympathy from many people. The Janata coalition was only united by its hatred of Gandhi (or “that woman” as some called her). With so little in common, the Morarji Desai government was bogged down by infighting. Desai resigned in June 1979 after Charan Singh and Raj Narain formed breakaway party of their own. Charan Singh was appointed Prime Minister, by President Reddy, after Gandhi promised Singh that Congress would support his government from outside. After a short interval, Congress withdrew support and President Reddy dissolved Parliament in the winter of 1979. Before the 1980 elections Gandhi approached the then Shahi Imam of Jama Masjid, Syed Abdullah Bukhari and entered into an agreement with him on the basis of 10-point program to secure the support of the Muslim votes. In the elections held in January, Congress was returned to power with a landslide majority. In the 1977 elections, a coalition led by the Sikh-majority Akali Dal came to power in the northern Indian state of Punjab. In an effort to split the Akali Dal and gain popular support among the Sikhs, Indira Gandhi’s Congress helped bring the orthodox religious leader Jarnail Singh Bhindranwale to prominence in the Punjab politics. Later, Bhindranwale’s organization “Damdami Taksal” became embroiled in violence with another religious sect known as the “Sant Nirankari Mission” and he was accused of instigating the murder of the Congress leader Jagat Narain. After being arrested in this matter, Bhindranwale disassociated himself from Congress and joined the Akali Dal. In July 1982, he led the campaign for the implementation of the Anandpur Sahib Resolution, which demanded greater autonomy for the Sikh-majority state. Meanwhile, a small section of the Sikhs including some of Bhindranwale’s followers, turned to militancy in support of the Khalistan movement, which aimed to create a separate sovereign state for the Sikhs. In 1983, Bhindranwale and his militant followers headquartered themselves in the Golden Temple, the holiest shrine of the Sikhs, and started accumulating weapons. After several futile negotiations, Indira Gandhi ordered the Indian army to enter the Golden Temple in order to subdue Bhindranwale and his followers. In the resulting Operation Blue Star, the shrine was damaged and many civilians were killed. The State of Punjab was closed to international media, its phone and communication lines shutdown. To this day the events remain controversial with a disputed number of victims; Sikhs seeing the attack as unjustified and Bhindrawale being declared the greatest Sikh martyr of the 21st century by Akal Takht (Sikh Political Authority) in 2003. On October, 31 1984, two of Gandhi’s bodyguards, Satwant Singh and Beant Singh, shot her with their service weapons in the garden of the Prime Minister’s residence at 1 Safdarjung Road, New Delhi. The shooting occurred as she was walking past a wicket gate guarded by Satwant and Beant. She was to have been interviewed by the British actor Peter Ustinov, who was filming a documentary for Irish television. Beant Singh shot her three times using his side-arm, and Satwant Singh fired 30 rounds. Beant Singh and Satwant Singh then dropped their weapons and surrendered. Afterwards they were taken by guards into a closed room where Beant Singh was shot dead. Kehar Singh was later arrested for conspiracy in the attack. Both Satwant and Kehar were sentenced to death and hanged in Delhi’s Tihar jail. At 9:30 AM, Indira Gandhi was brought to the All India Institute of Medical Sciences, where doctors operated on her. She was declared dead at 2:20 PM. The post-mortem examination was conducted by a team of doctors headed by Dr. T.D. Dogra. Dr. Dogra stated that as many as 30 bullet wounds were sustained by Indira Gandhi, from two sources, a Sten gun and a pistol. The assailants had fired 31 bullets at her, of which 30 had hit; 23 had passed through her body while 7 were trapped inside her. Dr. Dogra extracted the bullets to establish the identity of the weapons and to correlate each weapon with the bullets recovered by ballistic examination. The bullets were matched with respective weapons at CFSL Delhi. Subsequently Dr. Dogra appeared in the court of Shri Mahesh Chandra as an expert witness (PW-5), and his testimony lasted several sessions. The cross-examination was conducted by Shri P. N. Lekhi, the defense counsel. Salma Sultan gave the first news of assassination of Indira Gandhi on Doordarshan’s evening news on October 31, 1984, more than 10 hours after she was shot. She was married to Feroze Gandhi. First, her younger son Sanjay had been her chosen heir; but after his death in a flying accident in June of 1980, his mother persuaded a reluctant elder son, Rajiv Gandhi, to quit his job as a pilot and enter politics in February of 1981. Over a decade later, Rajiv Gandhi was assassinated.